The Finnish Spitz comes from an ancient line of dog known as the Northern Spitz and can be characterized as an intelligent, energetic dog that loves attention. This lively canine is the perfect companion for the home as it does well in the family setting, but also excels at work. A hunter by instinct, this breed enjoys being in a cool to temperate climate and needs plenty of outdoor activity. 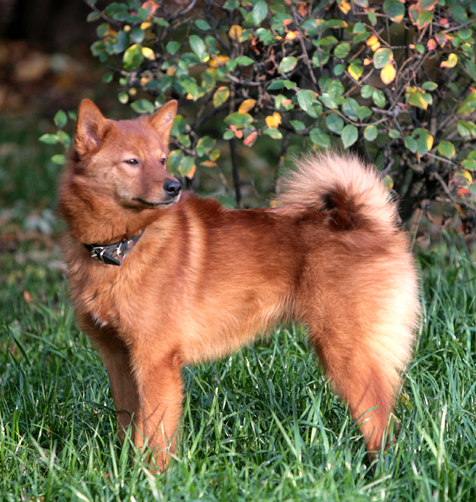 The Finnish Spitz has thick fur which it will shed moderately. In their native country of Finland, hunting is still a part of the Finnish Spitz’s life. Keeping this pet busy in ways that expend their naturally high energy is the key to ensuring they are content and mentally happy. Happy, intelligent, and playful with an independent streak. The Finnish Spitz is somewhat suspicious of strangers, but excessively affectionate with family and excellent with children. The Finnish Spitz is a considerably vocal dog with a loud bark, which may be inconvenient for those that prefer a quieter dog. Excessive barking can be a signal of boredom or anxiety, so make sure your Finnish Spitz gets plenty of attention. They do not handle being left alone well! The Finnish Spitz is a sensitive dog but can develop bad habits if improperly trained. Due to this breed’s independent nature, training your Finnish Spitz requires patience and regular attention. The Finnish Spitz is also independent-minded and will often lead its master. This behavior should be corrected with firm tones and situational training where the Finnish Spitz is made to heel or walk beside its owner. Excessive barking can also be avoided with proper training. The Finnish Spitz also has a lot of energy that needs to be expended. They make great jogging partners and should have a couple of 30-minute walks daily. These dogs are prey-minded, so they will likely run and chase other animals. It is always recommended that you keep your dog on a leash while exercising them unless you’re in a fenced-in area. According to some dog behavioral specialists, the Finnish Spitz can even be too intelligent and even manipulative with its owners, so plenty of attention is required for this breed to be content. It is not recommended that new dog owners or those who have little time to devote to training adopt this breed. Owners must be persistent and firm, but always avoid using harsh tones. If you are thorough with training, you can be greatly rewarded by your Finnish Spitz’s companionship!